Summer is back on my island. Or what I like to think of as my island, when in reality I live in a city at least a couple of hours from the nearest beach…even more if you are looking for the pristine shores you see in travel magazines. That being said, I am still a part of this archipelago and thusly take island life as my birthright. As I take tropical island fruits as my birthright. Mangoes, bananas, mangosteens, guavas, papayas, chicos, rambutans, jack fruit, star apples, and pineapples…I love them all. Sweet, creamy, or juicy…they tell tales of warm sunny days and clear blue skies under which they basked with nary a care in the world. When the weather turns steamy, as it is unapologetically doing right at this minute, my thoughts and my market basket turns to these fine specimens of the tropics. Mangoes, as I have already mentioned, are at the top of my list. I thank God every day that I live amongst the finest. Pineapples are a close second – its toe-curling sweetness and sticky juiciness heralds summer in with pomp and promise. Even succeeding in distracting me from the heat for the few glorious moments I am enjoying it. My favorite way to have pineapples is the same as with mangoes – straight from the fridge. There is nothing quite like chilled tropical fruit on a hot hot HOT summer day. – Slice your pineapple as I did here, but leave the slices thick. 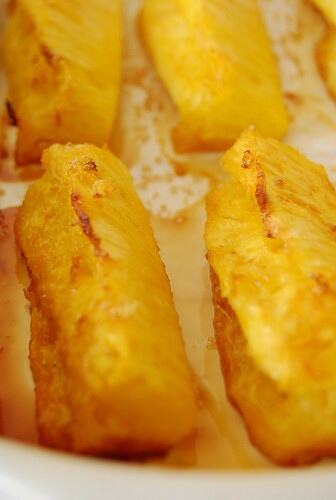 – Lay pineapple slices on a baking sheet or pan and sprinkle with brown sugar. Depending on the size of your pineapple, and your penchant for sweets, you may need more or less. – Roast in a 200C oven for about 20-30 minutes or until edges are caramelized. If you are one of my co-islanders, hang on, as this is looking to be one of our hottest summers yet! If you are on the other side of world, perhaps in a place where it is as cold as it is hot over here, I’ll trade you some of this pineapple for a box of fresh snow! That pineapple looks so tempting! A lovely way of preparing it. Sometimes it's just the beauty of living in a tropical country. I should try grilling some pineapples soon. We have some abundant mangoes in our garden – some indian and apple mangoes. I think some of them needs to be given away. Gosh….now you make me really miss home. I miss the heat and all the tropical fruits very much 🙁 It's so bitterly cold here in Scotland. Love your roasted pineapple. I must try it. I have had occasion to smoke pineapple. It was great! Ooo, how delicious that all sounds and summer… I am slightly jealous now although we did see the sun today for the first time in … well forever so I cannot complain really. And your roasted pineapple brings me even more sweet summer memories! Oh, I have some fresh pineapple in the refrigerator now and I know what to do with it! This sounds delicious! Just wish it were warm here to go with the luscious pineapple! You really make me long for summer. This is a great idea for pineapple! Pineapples are my favm even more than mangoes. Hi Rosa! Thanks, I really enjoyed it! Hi Trissa! Lansones, of course! Another delicious fruit! I’ve always longed for the berries and figs that we don’t have here, but at the end of the day I’m truly thankful for the wide array of tropical sweetness that we do have 🙂 Definitely, timtams are welcome! Hi Marymoh! Hang on and keep warm! Hope you can give this a go! Hi Ed! Smoked pineapple…sounds intriguing! Hi Junglefrog! Hope the sun will be making more appearances over where you are soon! Hi Pam! Sending you warm thoughts! Hope you like the pineapple! Hi Redmenace! Glad you think so 🙂 Wish I could send you some of my summer! Hi Anh! Hang on for summer! And luscious pineapples! I can eat a load of this fruit! This brown sugar roasted pineapple is refreshing, specially during the summer… i prolly will eat it with magnolia macapuno ice cream… or mantecado ice cream… now I'm craving for it na… hahaha! Grilled pineapple is great and I'm with you on cold tropical fruits. Yum. Even better cold tropical fruits on the beach. Heaven. Joey, I'm with ya about the mangoes, top of my list everytime. But this brown sugar roasted pineapple is just as mouthwatering! I envy you the bounty of fruits you have right now. I LOVE PINEAPPLE!! I've been dying to try it cooked this way for awhile now. Time to get on that cause it looks so good! Hi Malou! What a great childhood memory! Mmmm…love matecado ice cream…now you’ve given me a new idea for eating these! Hi Manggy! Well, we still live here so we can claim the beaches as ours as well 😉 I love langka!!! I especially love them frozen…mmm! Hi Wizzy! You said it…the beach would definitely make things perfect! Hi Ash! Isn’t it just such a wonderful exciting type of fruit? 🙂 Let me know if you give it a try! "Mangoes, bananas, mangosteens, guavas, papayas, chicos, rambutans, jack fruit, star apples, and pineapples…I love them all" me too! me too! And oh our mangoes!! I've done this as well, but on the grill. So good! But I always feel guilty adding sugar to things Mother Nature has already sweetened perfectly. Hi Nens! Ah my sister in fruit 🙂 I know what you mean about the added sugar…but what can I do, I’m greedy! 😉 I wish I had a grill! Hi Mirage! Mmmm…must try it with grilled fish…I imagine with grilled pork as well! Tropical fruit from the tropics! I do miss living in these parts. Hi Tasty Thailand! Truly! Although I must admit I sometimes have flashes of insane jealousy at those who can enjoy an abundance of berries and figs…but then I just take a bite from a mango and I quickly forget them!